LONDON, UNITED KINGDOM, April 15, 2019 /EINPresswire.com/ -- With just two weeks to go, this is the last chance to secure attendance for the highly anticipated, Defence Aviation Safety Conference taking place in London on the 29th and 30th April 2019. 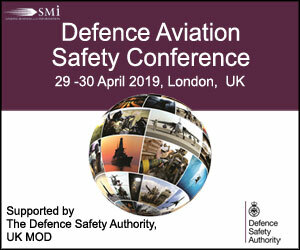 As the first event of its kind, The Defence Aviation Safety Conference will host a variety of senior UK MoD Aviation Safety Leaders as well as their international counterparts who are responsible for delivering and enforcing safety across their air platforms and systems. The event will include 24 expert speakers, 5 sponsors and exhibitors, plus there will also be a VIP speakers dinner hosted by Lead Sponsor BAE Systems, day-1 of the event. The event will also be chaired by: Lieutenant General Richard Felton CBE, Director General, Defence Safety Authority, UK MoD.